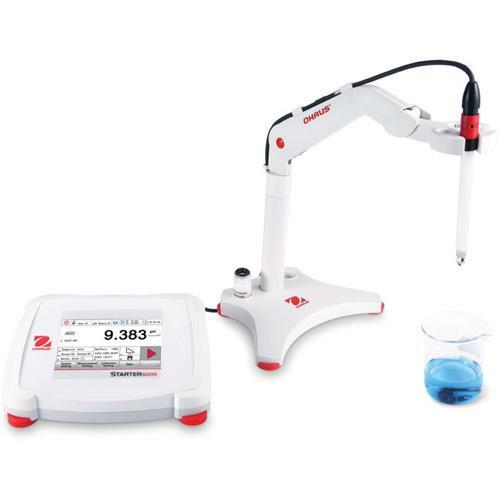 Various High-Level Capabilities Propel Powerful Performance — With a 1,000 measurement memory, eight predefined buffer groups, and three endpoint modes, Starter 5000 provides various ways to achieve precise pH measurement. Advanced Software and Technology Support Complex Applications and Intuitive Operation — Starter 5000 has a user-friendly interface, similar to other smart devices used daily. With a large LCD touchscreen display, users will find themselves intuitively navigating through all applications. Enhanced Features Offer Protection & Simple Use of this Advanced Meter — Starter 5000 also has many features that promote ease of use, convenience, as well as protection, including a standalone electrode arm, IP54 housing and in-use cover. This delicate measuring instrument requires proper care and maintenance to produce accurate and reliable results and to prolong useful life. Always keep the electrode moist when not in use for a period of time by using an electrode storage solution (3M KCl). DO NOT store the electrode in distilled or deionized water, as this will cause ions to leach out of the glass bulb and reference electrolyte, causing slow and sluggish response. Remove the electrode gently from the storage bottle and rinse it with distilled water before use. For long-term storage, always keep the electrode in the bottle filled with sufficient storage solution to cover the bulb. Replenish the bottle as needed. Suitable for normal samples. Use with OHAUS pH meters with BNC input connector and Cinch temperature connector. 4-3/4" x 3/4" 4-3/4" x 3/4" 4-3/4" x 3/4"
2-in-1 double saltbridge pH electrode. Suitable for samples which may react with Ag ions, such as trisbuffer solution. General purpose glass-body refillable pH electrode. Suitable for muddy samples such as juice, milk, etc. Use with all pH meters with BNC input connector. 4-5/16" x 3/4" 4-3/4" x 3/4" 4-3/4" x 3/4"
2-in-1 80mm length and 5mm diameter refillable pH electrode. Suitable for small samples, tubes, and narrow containers. 2-in-1 150mm length and 8mm diameter refillable pH electrode. Suitable for small samples, tubes, and narrow containers. Glass-body refillable pH electrode for pure water (distilled water, rain water, tap water, etc.). Use with all pH meters with BNC input connector.. Temperature variations can effect pH. However, at a certain pH (usually 7 pH), temperature will not have an effect on the potential of the system. This is known as the isopotential point. If automatic compensation is not practical, the magnitude of error equation can be used to determine error (0.003 pH/° C/pH unit from pH 7). Note: The temperature compensation here refers to electrode-related temperature variation and not solution-related variations. Related to the overall availability of electrons in the media, specifically the ratio of positive and negative ions in the solution. Also called Redox electrode. ORP is the only practical method for electronically monitoring sanitizer effectiveness. ORP value is an important parameter of water and is a measurement to oxidize contaminants. Normal application areas are swimming pools, fish farming, and aquariums. ORP is expressed in millivolts (mV). A range of -1000mV to 1000mV is common with most ORP tests. The pH value influences the ORP value significantly. If the platinum band or disk is contaminated, the electrode should be cleaned, otherwise response time will slow or inaccurate measurements will be given. 4-3/4" x 3/4 4-3/4" x 3/4"